Kombucha is a living symbiosis of bacteria and yeast that has been brewed in homes and shared with others for hundreds if not thousands of years. A living culture with such a long history must have some way of protecting itself from causing harm to those who care for it (i.e. homebrewers) or surely it would have been ditched generations ago. While our ancestors simply had to trust their gut, modern science is discovering the important role fermented foods have played in our culinary culture since recorded history (if not longer). The Human Microbiome Project has just begun to illuminate our understanding of the relationship between gut bacteria and health, but some of the preliminary findings are confirming what our ancestors instinctually knew: As Bacteriosapiens, fermented foods provide us with the regular influx of healthy, living bacteria our bodies need in order to boost proper functioning. The Kombucha culture evolved a few different defense mechanisms to protect itself from invasion from harmful microorganisms – low pH, ethanol and the SCOBY itself are all means that ensure the longevity of the culture. Let’s take a look at pH and the role it plays in protecting the culture. As you recall from the Top 5 Signs of Healthy Kombucha Brew, pH plays an important role in protecting the SCOBY from microbial invaders. Kind of like a chemical force field, the low pH creates a highly acidic environment in which our native bacteria and yeast thrive but simultaneously inhibits the growth of disruptive foreign & potentially harmful microorganisms. pH was first conceived by Danish chemist Søren Peder Lauritz Sørensen at the Carlsberg Laboratory in 1909. Carlsberg Lab was set up by the Danish beer brewing company to advance biochemical knowledge, especially as applied to brewing beer. While studying proteins, Sørensen devised the pH scale as a means to express the concentration of hydrogen ions present in a solution. While there are conflicting explanations for the definition, the most commonly accepted answer is that “p = potential” and the “H = hydrogen.” pH is a measurement of the acidity or alkalinity of a solution. When a substance dissolves in water, it produces charged molecules known as ions. Acidic water contains extra hydrogen ions (H+) and basic (alkaline) water contains extra hydroxyl (OH-) ions. As we can see on the chart below, the relationship from one pH level to the next is exponential. 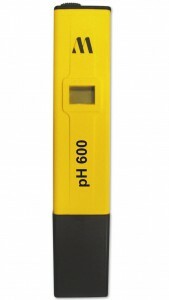 The pH scale ranges from 0-14 with readings in the 0-7 range termed acid and readings in the 7-14 range termed alkaline. 7 is considered neutral and the ideal pH for our blood is just above 7. Without going into too many details, there is an important correlation between pH and health. While Kombucha tests on the acid side, much like lemon juice or apple cider vinegar, when it hits the digestive system it creates an alkaline ash. (See pH post part 2 which will also include how to track your own pH). The symbiosis of Kombucha cultures occurs between the yeast and bacteria, organisms which have evolved to work together via a system of balanced competition, with each contributing to the health and life cycle of the other. 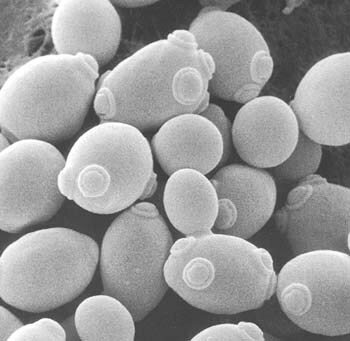 Acetobacter/Gluconacetobacter, the dominant type of bacteria in Kombucha, creates acetic acid – one of the most healthy acids and a clue to Kombucha’s low pH. Most have heard of the health benefits of acetic acid in the form of consuming small amounts of vinegar, which is typically a 4-7% acetic acid solution, whereas Kombucha checks in at a much more palatable ~1% acetic acid, often much lower in commercial versions. On the pH scale, white distilled vinegar tests around 2.4 pH while a properly brewed batch of Kombucha may fall anywhere from 2.5 – 3.5. With this knowledge we can then infer (and taste!) that the lower the pH, the tarter the Kombucha. Obviously then, the obverse is also true – the higher the pH, the sweeter the Kombucha. 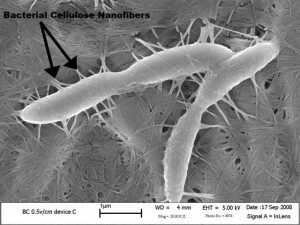 Acetobacter xylinium create nano fibers that knit together creating the SCOBY. However, pH does NOT indicate that the Kombucha has finished the fermentation process. It confirms that the brew is protected from microorganisms. The pH should drop to the correct range of 3.5 and lower within the first few days of brewing. We use our most sensitive tool – our tongues – to decide when the appropriate amount of sugar has been converted. So while liquids with high concentrations of acetic acid have a low pH, they are correlated but not directly related. For example, apple cider vinegar (5% acetic acid) from my pantry tests as 2.9 pH while my flavored homebrew Kombucha (~1% acetic acid) comes in at 2.7 pH. Yet the ACV is undrinkably sour and disgusting while my Pink Lemonade Kombucha (or even unflavored booch which checks in at 2.5 pH) is dry, tart and delicious. Admittedly, we like our Kombucha sour. By tasting and testing, one can train the palate to discern the subtle differences in flavor and match them to the pH value, especially when tracked along with brewing time. According to the FDA’s guidelines for compliance, foods with a pH of 4.6 and lower have been deemed safe for sale without needing further preservatives: “When the pH of a food is 4.6 or below, spores of C. botulinum will not germinate and grow.” This means that not only is your KT safe from invasion by harmful microbes, but so are you! Kombucha Mamma Sez: While incorporating a variety of ferments in your diet is key, IMHO Kombucha is the queen of ferments because it is made from tea which has already been proven to have a host of health benefits. Researchers in Brazil found that Kombucha’s antimicrobial activities protected against E. coli, Salmonella typhi & M. canis and were found to be most effective after 28 days of fermentation (perfect for Continuous Brewers!). Their research also revealed the cyclical nature of the symbiosis. 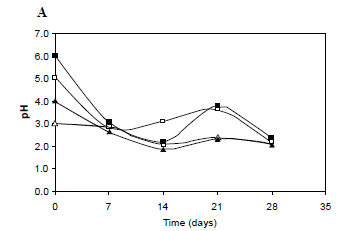 After about 14 days of steadily declining pH, the activity shifted and the pH gradually rose and peaked again at 21 days, then shifted lower again at 28 days (see graph below). These peaks and valleys indicate the ebb and flow of the symbiotic process of Kombucha. First the yeast consume the sugar and produce CO2 & ethanol, then the bacteria consume the ethanol and produce healthy acids. The process repeats itself as the bacteria and yeast feed upon each other’s waste products. Adding sugar in the bottling stage reactivates this process and yields a different flavor than a freshly decanted Kombucha tea. Priming sugar is either a pinch of sugar added to the bottle or comes from the fruit or other flavoring agents. When added in the secondary stage, in an air tight environment, it reactivates the yeast which releases CO2 into the liquid. This is how we boost the natural carbonation that so many Kombucha drinkers love. This low pH environment also means that Kombucha seldom “goes bad” in the way that we normally think of food spoilage. As Sandor Katz has said, fermentation is one of nature’s methods of preservation. The low pH prevents organisms responsible for spoilage from surviving. The ferment remains active in both an anaerobic environment (without oxygen, i.e. in the bottle) and at colder temps (i.e. in the fridge), just at a much slower pace. Good Sanitary Practices are Key! As with all food preparation, it is important that sanitary practices are observed in order to prevent illness. Here are some tips for safely brewing Kombucha at home. The easiest way to test the pH of your Kombucha is with pH strips or with a pH meter. 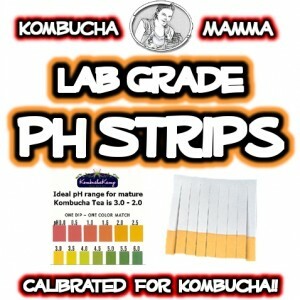 If using pH strips, be sure they are in the correct range for your Kombucha (0-6). The strips are an easy, disposable way to check that the brew has reached the correct level of acidification. The meter offers greater precision and uses. Kombucha Mamma Sez: You don’t have to test the pH of your Kombucha unless you want to. However, these modern testing tools can provide peace of mind that the brew is progressing correctly as well as an interesting lesson for young and old – plus the meter is a easy way to track other ferments or your own body’s pH if you like! Immediately compare with the color coded guide. *Tip – The orange color of the litmus paper attached to the pH strip is already the correct color for the ideal pH of Kombucha. If the color remains the same, then you are in the correct range! Rinse off buffer solution with filtered water. Place the pH meter in a small dish of Kombucha. It may take 10-30 seconds for the meter to settle on the correct reading. Use a small piece of damp sponge at the bottom of the black cap to keep the electrode moist. Tasting your Kombucha and testing the pH will help you recognize the different stages of the brewing cycle. Once they are familiar, you will easily be able to detect where you are at in the process with just a sip or two! Im curious what the Kombucha does to the ph of your body as I have read sites saying different things… any idea? I don’t like my kombucha too tart so stop the first fermentation around PH 3.3. The problem is I then add fruit for the second fermentation and this raises to PH to above 3.6 and it stays there once the second fermentation is finished. Does this mean my drink is no longer technically kombucha? Not at all! As long as it tastes delicious and it is below 4.6 then it is safe to drink! Hi, I’m a first-time brewer….. I bottled my first batch 2 days ago and placed the bottles in the refrigerator immediately. Today I read that I should have placed the bottles in the cupboard for 3 or 4 days before refrigerating. Did I ruin the batch….is there a fix for this? If my continuous brew is less than two months old and the KT is tasting vinegary within 2-3 days with a pH of 3.0, should I still clean out the brewer and start with fresh nutrient brew? The scoby is only 5 months old. What if my ph is at a 4 (used the ph strips)? It still tastes sweet at 7 days. Do I need to start over or give it another week to ferment? Could use more time. Fermentation is temperature dependent. If its too cool or taking too long, consider adding a heater. This is my second brew. The first brew went well under the same conditions. This second brew dropped to a PH of 3.3 after 3 days. It is now day 11 and the PH is sitting at 3.9. The taste is still a little sweet, and I seem to have a brain fog shortly after ingesting. This has never happened to me after drinking kombucha. No signs of mold, and a new Scoby is growing. Any advice? Should I throw this batch away? If you run into a “stuck” fermentation where the pH isn’t lowering, then it might need more oxygen. Try stirring it with a spoon (don’t worry, you won’t hurt the SCOBY) and see if it doesn’t start to drop again in a few days. Have maggots growing on top of scobie and dead maggots in liquid. Very small maggots. The p in pH stands for -log (base 10). A pH of 3.0 means there are 10^-3 moles per liter of H+ ions. I didn’t know we had to test the ph range. I just drank about 8oz of 2fermented kombucha and didn’t test it. Is this a health hazard? pH testing is for troubleshooting. Provided there is no mold on the cultures then you are good! I read about a business that does “dry” brewing that has a very low sugar content in it’s but. How is this done? Reducing the amount of sugar also reduces the flavor. You can try it by using different amounts of sugar. Experiment to find the qty that yields good flavor and also encourages SCOBY growth and proper fermentation. I’m new to continuous brewing and I’m nervous because my kombucha is always very vinegary. I’ve tried draining some of it off and adding black sweetened tea to neutralize it. But it seems that only a day or two later it’s very vinegary again. So it’s either sweet and tastes like tea or vinegary. What am I doing wrong? Where do I find that happy medium? It tastes too vinegary to drink. If it sours too quickly, that is a sign it is time to clean out the vessel. Refer to the Complete Handbook – Chp 5 & 8 or the EZ UPkeep videos for full instructions on how to do that. Can alkaline water be used to make kombucha? I have a kangen water filter. It has several different pH options…9.5,9.0,8.5,7.0,6.0 and 2.5. Which would be good to make my sweet tea with? We are new to making Kombucha and are on our 4th batch, starting from a dehydrated scoby. So far the brew has been almost too tart for our liking and I don’t know how to address that. Today was day 5 for this current batch. I tested the pH and it was 2.8. Should it be higher for it to taste less tart? How do I accomplish this? Thanks so much for your help! We don’t recommend using dehydrated cultures as they lack the starter liquid needed for optimum flavor and fermentation (see article here). If you are using vinegar as your starter liquid, it may be dropping the pH too quickly which may cause the brew to be too tart, though pH alone will not be enough to determine if it is too sour – a Brix measurement or using your taste buds will offer that additional information. I am in the process of brewing my first batch of Kombucha. I am on day 8, and have a healthy scoby, but a pH level of 5-6. I am not clear when the lower pH happens..after bottling! Is there a correlTion between pH level and when to bottle? Thx. The pH of Kombucha drops to 3.5 or lower within the first 3 days if all of the conditions are correct. If your pH is that high, then something is off in the brew. 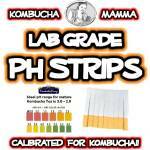 First, confirm the pH strips you are using can tolerate the lower range of Kombucha (0-6) or consider purchasing a meter (make sure it is properly calibrated). Then test again. If the pH is still at that level, then we would not recommend consuming it. The correlation between pH and bottling is not accurate unless other metrics such as Brix and the brewing conditions are also factored into the equation. I have been brewing booch 4 months i live in minnesota where the weather is strange ,a couple batches got mold.So starting out fresh .Is it ok to put on top of fridge /out of direct sun.I have 4 vessels going .LOVE THE booch ,gave scoby away to random person whom showed interest. Yes – on top of the fridge out of direct sunlight is a great place for Kombucha. The warm air from the fridge exhaust can help keep it warm. Kombucha inspires sharing! I just started brewing kombucha and am doing the continuous brew. I started testing the ph on day 8, and it was 3.5, and now on day 12 it is still 3.5. I have maintained the temperature between 78-82 and am wondering if this is normal that it would take this long? Is there anything I should be doing? It still tastes really sweet to me. Thanks! As the post states, pH is not an indicator of doneness but rather an indicator that your brew is protected. Taste is how we determine when our booch is ready to enjoy! Ok, did some research and looked up the translation of kun and bu (the pinyin versions). “Giant fish cloth that covers” cha “tea”. So it seems to be referring to the appearance. How did kombucha evolve? In what environment? I doubt tea water is a natural occurrence. Was it bred into that environment? Kombu is Chinese for a type of seaweed, but I never hear any mention of it. It may have another meaning, but cha must likely means tea. Was kombu originally used? If you find any information regarding this, will you please email me. Thanks!